I think we’re all still pretty shocked that I actually enjoy brussels sprouts. And! Let’s take a moment thank the heavens above that I do or else… nary a vegetable would cross my lips. And in order to continue this… fondness… I have for the little green chunks o’ love, I gotta make sure they don’t overstay their welcome. Ever. Because I can’t get sick of the one plant type thing I’ve got going on. !! Duh. Now now… I realize I’m eliminating a majority of the population here with coconut AND brussels sprouts. I mean… most normal people ahbor tiny cabbages. A ton of other people think coconut should be eliminated from planet Earth. Frankly, I think they should be eliminated and leave me some alone time with my coconut. I’m possessive, needy and insecure. For some of you (like ummmm, my husband), this is your ultimate worst nightmare. I could not combine anything more disgusting, right? Well… go sit over there in the corner and leave me be, because I’m hungry. I pan-roasted the heck out of the brussels until caramely, added some coconut to toast, drizzled on some lite coconut milk and then ate them like there was no tomorrow. Delicious. We (and I really just mean I) served them with those maple-glazed pork chops and pesto mac and cheese… then fell into food comas for four days. My kinda sleep. 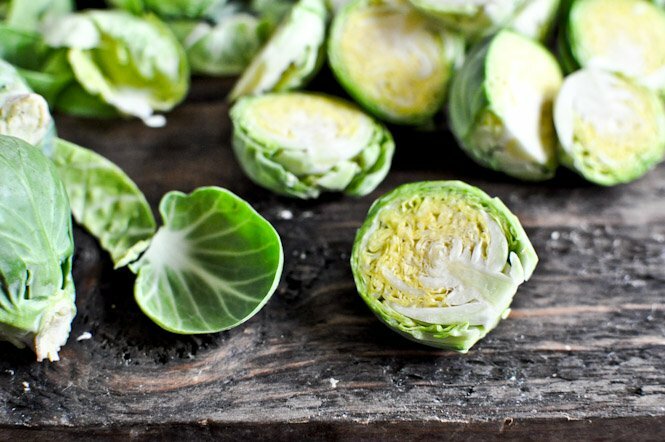 Add quartered brussels to a bowl and sprinkle with salt, pepper and nutmeg. Drizzle with coconut oil and toss to coat. Heat a skillet oven medium-high heat and once hot, add brussels. Cook for 6-8 minutes, stirring occasionally until toasted and charred. Reduce heat to low and stir in coconut milk. Stir in 2 tablespoons toasted coconut, then transfer to a bowl to serve. Top with remaining toasted coconut. I’ll totally make this up to you tomorrow. 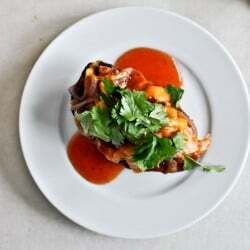 BBQ Chicken Stuffed Sweet Potato Skins. I made this tonight to go along with dinner and it was AMAZING :) thanks for sharing this. I guess this was the week for brussels sprouts. I would have never thought to pair coconut with them. Your recipe made my mouth water, and mine was pretty darned good, too! I need these in my life. like right this very second! Wow – never would have thought of this combination. I must try it. I used to hate Brussel Sprouts, but I love them now that I learned to roast them. I also have a peacan/crasian/brussel sprout recipe that I LOVE. Thanks for this great inspiration! These intrigue me. SO much. 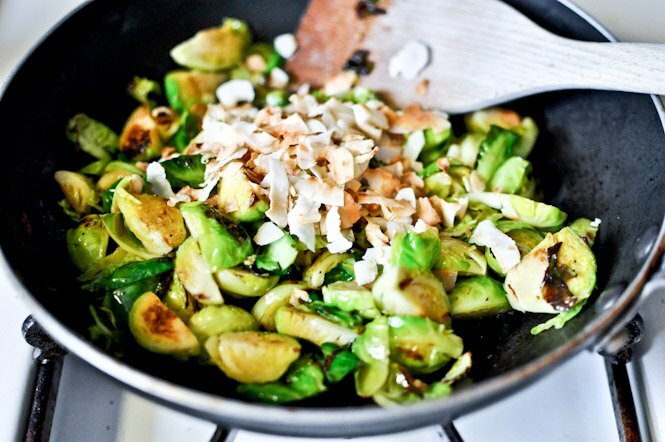 My fiancé and I both love coconut, and I’m trying to learn to like brussels sprouts (so far, without butter and bacon grease, we’re not friends) so this sounds like a great recipe for us to try! Especially next to that mac and cheese…drool. I totally love your blog. The way you say things, the receipes, etc. next time I update my blog, I will put you as a favorite link! How in the world did I miss this recipe. You combined my two favorite things. Y.U.M. I just found this recipe and I may have eaten nothing but a big bowl of Brussels sprouts for lunch two out of the last three days!